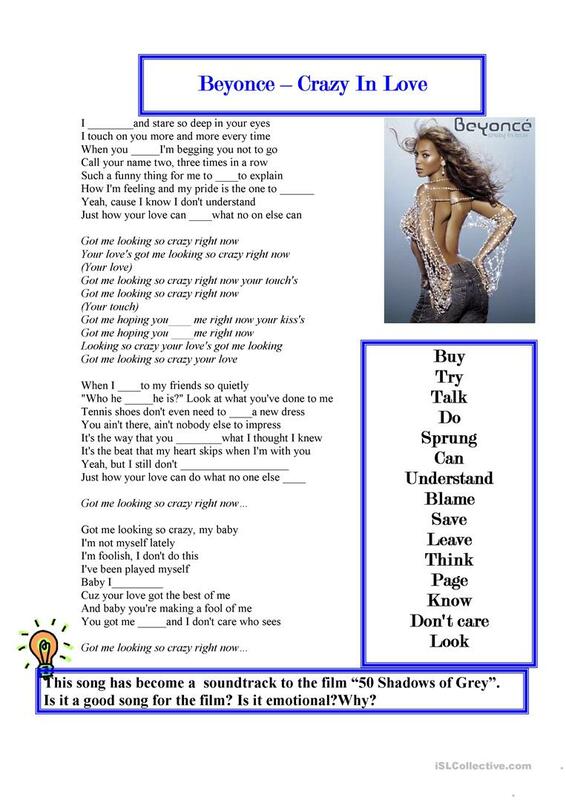 Popular song to practice filling the correct verb that missed in lyrics.Just for fun and to repeat some verbs.We also sang it in the class.Girls liked it))).They asked me to prepare it. The above downloadable printable is intended for high school students and adults at Elementary (A1), Pre-intermediate (A2), Intermediate (B1) and Upper-intermediate (B2) level. It was designed for enhancing your groups' Listening, Spelling and Reading skills. Yulyashka is from/lives in Ukraine and has been a member of iSLCollective since 2012-01-27 00:12:22. Yulyashka last logged in on 2019-04-18 17:15:02, and has shared 5 resources on iSLCollective so far.